Be more specific about “messed up”. If the ribbing looks too loose, you might have to make it on a smaller needle size. Some knitters have a tendency have a looser tension with ribbing. Your patterns are lovely and it is so kind of you to share them. 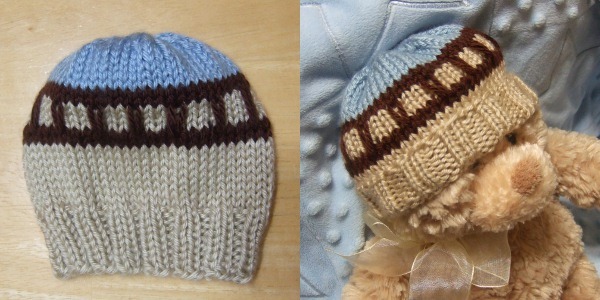 do you have a pattern for a little baby boys hat with ear pieces that maybe tie, button or velcro under the chin. Thank you so much for offering your patterns. I have been knitting for years and donating all products. I appreciate you having straight needle patterns. I do use the circular needle but much prefer 2 needles as I am not very good with the 4 double ended needles when the hat is too hard to work on the circular. Do I do 8 rows or 4 of the ribbing? If I do 8, can I fold it up if it’s too many? There are two rows of ribbing instructions so doing them three times will result in a total of 6 rows for the preemie size and doing them 4 times will result in a total of 8 rows for the newborn size. It probably isn’t enough to fold up neatly. This is a cute hat. Knitting a hat with straight needles would be challenging for me. This is a nice alternative technique though.